WORM technology can archive data in non-rewritable, non-erasable format. Using this method, recorded data can no longer be overwritten, modified or manipulated. The WORM protection process offered by QStar complies with the strictest national and international regulations covering sensitive data archiving, document management, electronic record storage and log file archiving. 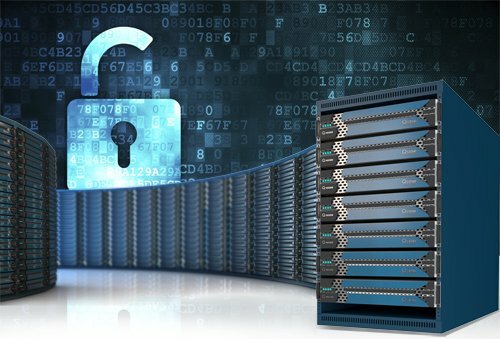 The Q-WORM solution guarantees secure, legally-admissible, long-term retention of archived data. Q-WORM solution has been also adopted as a secure storage technology for sensitive log files in telecommunications by law enforcement investigations. Q-WORM can be up and running in less than one hour. The Q-WORM solution is completely transparent to applications and users, does not require any changes to the existing infrastructure, software or the way archived information is accessed, provides high performance and very low purchase and operating costs. Q-WORM software can be installed within an existing infrastructure with no need to purchase new hardware. It is extremely simple to install and configure both on physical and virtual servers (VMware, Hyper-V, etc.). Q-WORM does not require separate backup procedures. Q-WORM offers a secure environment which, among other things, is auto-consistent and therefore does not require separate backup procedures. Q-WORM can be also offered in a fault tolerance configuration with 99.999% system uptime. Q-WORM configurations include disaster recovery and geographic distribution for the most critical applications that must ensure maximum operational continuity. A retention period is established for a single file or for each volume designated as WORM. Depending on the specific needs, the retention period can be set to expire after a certain number of months or years, or never for permanent retention. As soon as a volume is designated WORM, files in that volume are automatically locked and cannot be later modified. All data stored in WORM mode can be encrypted to prevent sensitive data being read by unauthorized personnel. Log files are increasingly used to track incoming and outgoing activities such as in the field of communications. Log files from the network service provider, the provider hosting the website that the user is browsing, mailbox access logs, log files generated by mobile phone cells that enable location tracking, and so on. Examination of the log files allows you to track the person who has performed certain operations using the IT and telecommunications tools at their disposal. Traditional backup solutions are not able to save such data in a timely manner. The Q-WORM solution can efficiently archive massive numbers of small files (hundreds of millions) like log files without suffering performance loss, an essential requirement when archiving this kind of information created by IT systems. In addition, QStar has developed specific policies to protect archived logs even in the event of a disaster. The Q-WORM solution for log file archiving is used by major international companies, including telecommunications companies that store billions of log files using Q-WORM technology. Q-WORM software can also be installed in virtual machine (VM) environments such as VMware, Microsoft Hyper-V, Citrix XenServer, Oracle VM and KVM. The Q-WORM software allows you to use existing storage by simply allocating storage space for protecting archived data in WORM mode, in this way reducing investments in hardware. 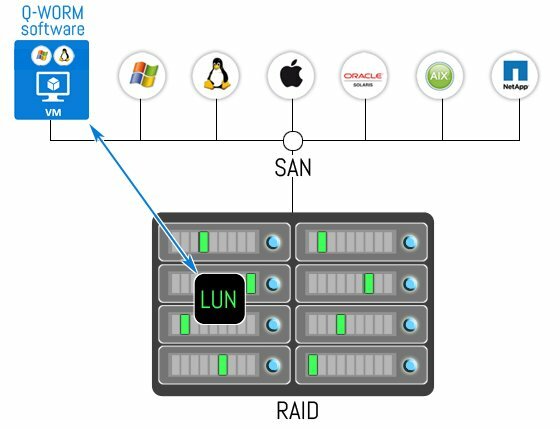 The Q-WOR M software is virtually compatible with any commercial RAID system.